Country Road 210 was just pine trees in the recent past. Now it is home to huge planned subdivisions with wonderful amenity centers & some golf courses: St. Johns Golf & CC, St. Johns Forest (gated), South Hampton & Cimmarone Golf (gated) to name a few. 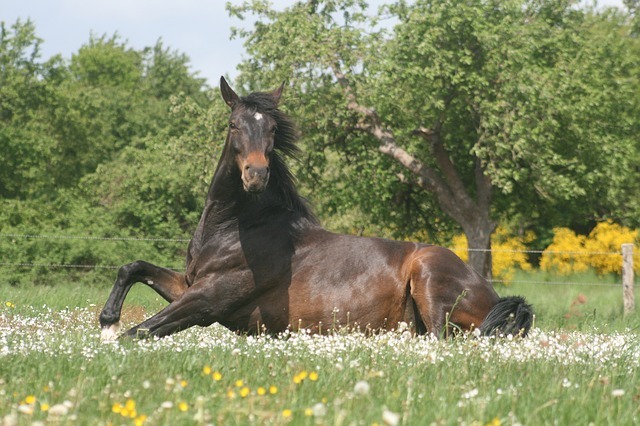 You also have a few equestrian neighborhoods along with acreage available for custom building. Located between St. Augustine and Jacksonville; the commute is easy with access to I-95. Contact your St. Johns County Realtor today to get started. Unfortunately this area hasn't been given a better name. 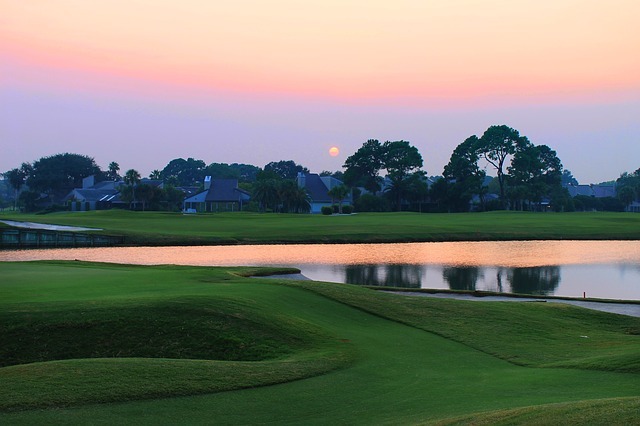 What was once rural land and horse farms is home to more golf courses than anywhere but Ponte Vedra Beach. This County Road 210 Corridor (CR-210) is located around I-95 in Northwest St. Johns County south of Julington Creek Plantation and North of World Golf Village. 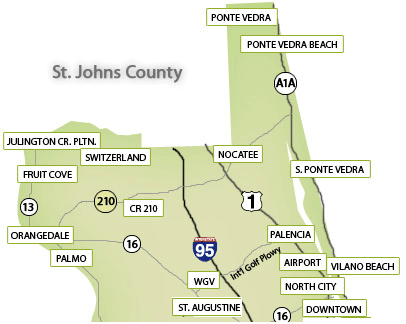 There is no better location in St. Johns County besides Ponte Vedra Beach for commuting into Jacksonville for work. You have easy access to I-95. And if you are commuting to St. Augustine then it is just as easy! The beautiful Country Road 210 stretches from the St. John's River to the ocean. The 210 Corridor refers to the area that is west of I-95, which until recently was largely undeveloped. This community is seen as a very desirable area, especially in terms of commuting to Jacksonville or St. Augustine while enjoying all the amenities of a much larger town. When you head South on I-95 out of Jacksonville, take the first exit, and you'll be home! A Name is Only a Name…. This area, in Northwest St. John's County, has gone by varying names. You'll hear it referred to as St. Augustine, Jacksonville, St. John's, and just about anything in between. Long-term residents called the region varying names, while maps call the area another name. Even the post office is involved with the naming, designating the area north of the highway as "St. Johns," while the South side, further away from the city, is called St. Augustine - even though it is well away from the real city of St. Augustine. Regardless of what you call it, call 210 Real Estate home. The commute is smooth, with open highways leading to both Jacksonville and St. Augustine. No traffic lights to impede your day, with the only real issue being traffic that occasionally backs up off of I-95. Homes in the area are mostly single family homes. Occasionally, you'll see some townhomes sprinkled in, but this is not the area if you prefer apartment or condominium living. Instead, this area is perfect for families who are looking for space to call their own. Homes here have their own spot of ground suitable for a small garden or a carefully manicured veranda. Single family homes can be less than 2,000 square feet or well over 4,000 square feet and are either one or two stories. Townhouses can start as low as $150,000 and single family homes start at $250,000 and rise into the millions of dollars. This area of St. Johns County is geared towards resort living. Every amenity you can imagine is found in one CR 210 community or another, and it is fairly typical for the communities to have large, resort-sized swimming pools and even water slides. If you enjoy a private gym, this is the area for you. Many of these communities even have social directors or event coordinators to help you plan your daughter's sweet 16th birthday or your son's wedding. Experience your 25th anniversary in the luxury of your own community. Let your children enjoy the safety and small-town feel of pizza nights and community garage sales. And who wouldn't enjoy the occasional parents' nights out - knowing that your children are safely tucked in your community and neighborhood baby sitters? What Communities Can I Choose From? Major St. John's County communities include the St. Johns Golf and Country Club, St. Johns Forest, South Hampton Golf and Country Club, Cimarrone Golf and Country Club, Stonehurst Plantation, John's Creek, Johns Glen, The Vinings, Southlake, Southern Grove, Wingfield Glen, and Glen St Johns. Glen St. Johns is a brand new development of single family homes that is starting from $208,000 - $308,000, making these luxurious, new homes affordable for many families. You can enjoy all of the space you need, ranging from three to five bedrooms - and of course, spacious garages. St. Johns County is one of the best districts in America. With 17 elementary schools, 5 high schools, and 7 middle schools, the St. Johns County school district is continuing to grow. Within the next year, two high schools will open and the county's only K-8 will go into operation. Imagine the stability of having your children attend the same school for eight nine years! In St. John's County, your child may only need to attend two schools between kindergarten and graduation - a great way to build stability and the benefits of a community. The St. John's schools have been given the prestigious "A" designation by the State of Florida's Department of Education, and we all know how much work it takes to acquire an A. This is the kind of effort and education your children deserve! A number of colleges are nearby, and the local library system cannot be beaten. How Are the Professional Prospects? The job market is great in this area and commuting is a breeze. There's less than 4% unemployment in the region and the median income for the Corridor is $75,000. Live in an incredible home while working at a job you love. The Cornerstone Regional Development Partnership helps create and retain jobs, making this a near perfect area with homes for sale.